I’m fine. The earthquake/tsunami which hit Japan on March 11th was definitely felt where I live, but I live well outside of the disaster areas. I’m also far from the troubled Fukushima Nuclear Power plants and it’s mandatory evacuation zones. Although Niigata Prefecture is Fukushima Prefecture’s neighbor, there was relatively little damage sustained. 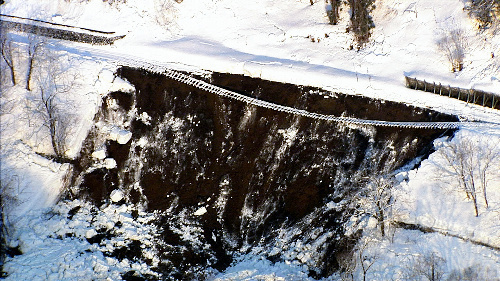 The Iiyama Line, a route connecting Niigata and Nagano Prefectures, suffered a partial collapse, closing the line until it’s repaired. It’s expected to be reopened sometime around the end of the month. All other lines in Niigata Pref. continue to run, some with limited services. The seasonal Banestsu Monogatari steam train running to and from Aizu-Wakamatsu in Fukushima has indefinitely been suspended. Other trains which often serve tourism purposes have also been cancelled for the time being. 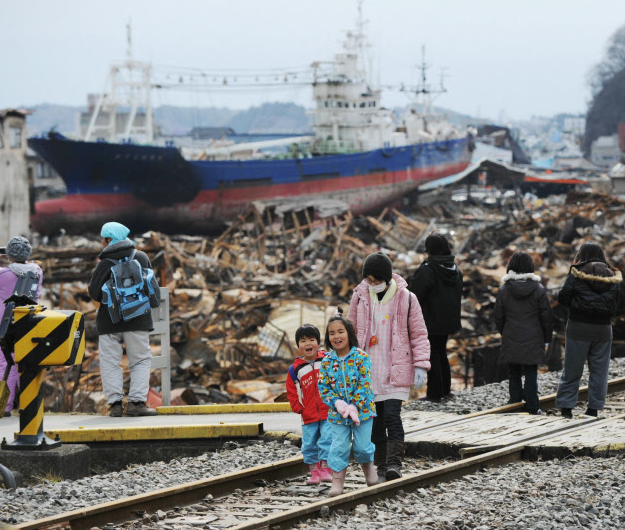 Although inconvenient, it still pales in comparison to the extend of damage caused on the east coast of Japan. The Joban Line, which runs from Tokyo to Sendai, runs along the coast for most of the journey. Needless to say, much of it was devastated. 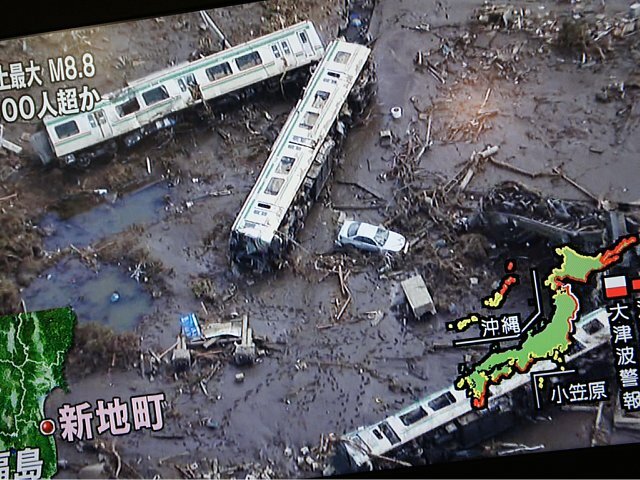 The Yamada Line, which runs from Sendai to Miyako, Iwate Pref., and the Kita-Riasu Line, going from Miyako toward Hachinohe, Aomori Pref., was also heavily damaged, if not completely washed away. 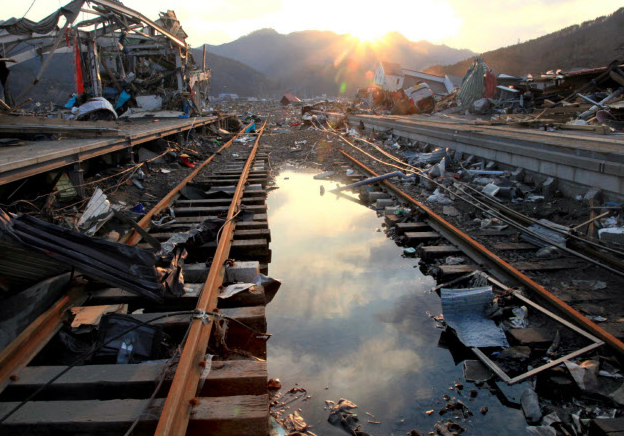 In the hours after the disaster, numerous trains went missing and were swept away from the tsunami. There are stories of passengers leaving the train and leaving for higher ground, but I haven’t been able to find information on everything. Although the line has been reopening in sections, its expected to continue full service on April 20th. Remember, this was a freakin’ 9.0 magnitude earthquake. The quickness of repairing not only the shinkansen line, but all other lines has been nothing short of amazing. Freight lines were also quickly reopened in order to transport relief goods to the affected areas. …and then the answer came to me. Continue to travel. Japan is amazing, and while I’m here, I want to continue to see as much of it as I can, whether it be by rail, car, bicycle, piggy-back a drunk businessman, whatever. From what the numbers are saying, foreign tourism is way down. Not only that, even those already living here are a bit timid to start traveling to and fro again. Despite the continuing aftershocks, and the uncertainty of the nuclear “crisis,” I don’t think thats a reason to stay home. 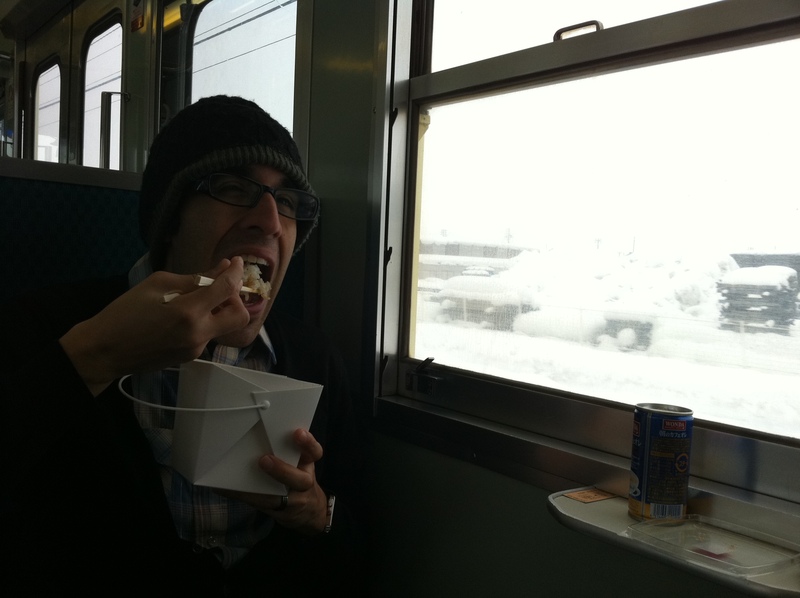 I see continuing to sightsee as a win-win for both Japan and myself. The money I spend goes right back into the economy, and the memories I receive are priceless. The entire Tohoku region still has incredible places to visit, and I’m still determined to visit it someday. 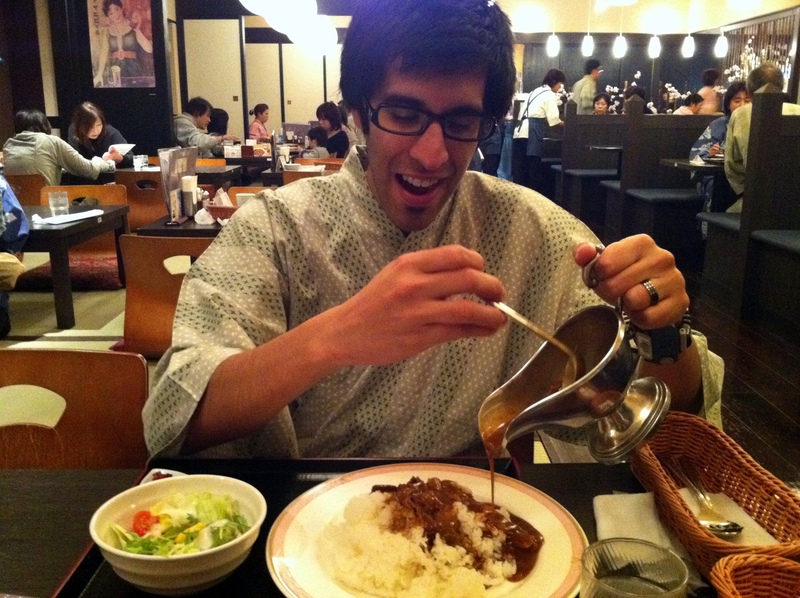 Japan WILL recover, and I hope to contribute to the recovery effort as much as everyone else. It’s the least I can do. Finally, some things related to the site. I know it’s been a while since the last update, but there are plenty of things to write about, so expect some new posts throughout the week. First, I’ll be taking the train out to Joetsu City tomorrow to do a little cherry blossom partying. Also, Golden Week holidays is upon us at the end of this month, which means a trip to Kyoto and Hiroshima!! Finally, I’ll update about my trip to Okinawa last month, including a ride on the Okinawa monorail. (A little late, but) Happy New Year!! I’d like to introduce a new section, and its a section that I hope becomes the focal point of this blog. Today brings Part One of a series called Densha de Dan. Densha de Dan will cover my travels around Japan by rail, not only including information about the trains and routes themselves, but everything else around it. For me, traveling by rail is just half the adventure. The other half comes in exploring your destination, whether intentional or not. To be honest, I wish it was a project I started when I first came to Japan, since my journeys by rail have taken me all the way to the most northern point of Japan, down to Miyajima in Hiroshima Prefecture, and everything else in between. The journey to Mt. Yahiko isn’t a far one. In fact, on a clear day, I can easily see it from my apartment. But for one reason or another, I’ve never made the trip by train. So, one free Saturday afternoon, we decided to make the trek. Our adventure starts at Nagaoka Station. 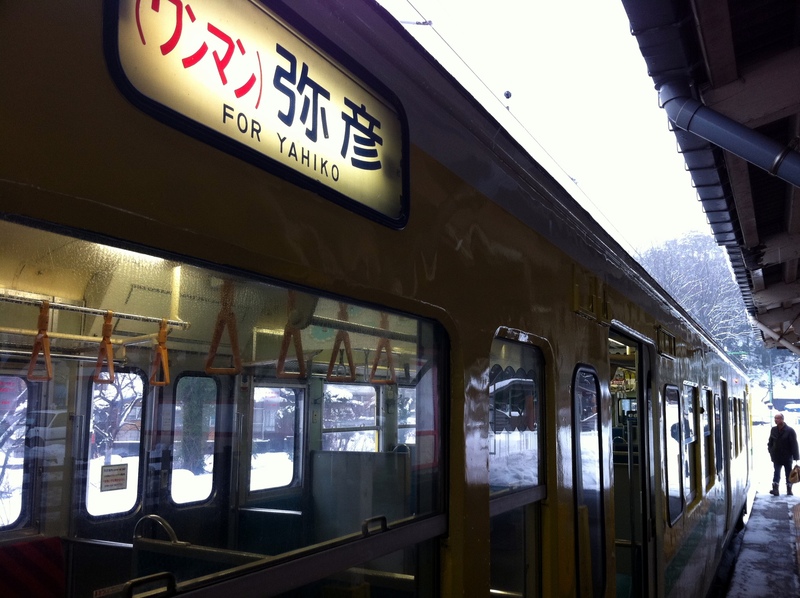 The 40.6 km trip will move across two train lines: the Shinetsu Main Line, and the Yahiko Line. With transfers at Higashi-Sanjo Station, and (sometimes) Yoshida Station, the trip can take between an hour to 2 hours, depending on how long each transfer is. 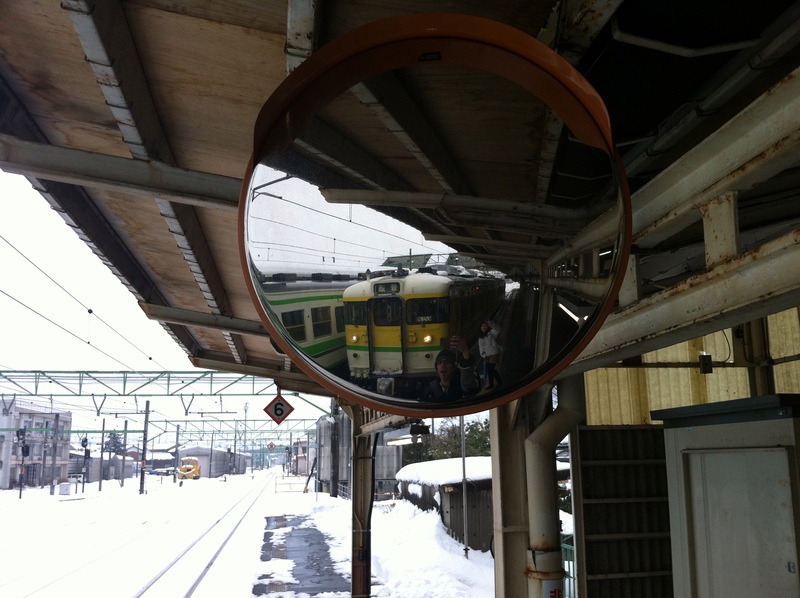 The service on the Yahiko Line is very limited, which can sometimes leave you waiting for the next train to arrive. same price as a big mac extra value meal. 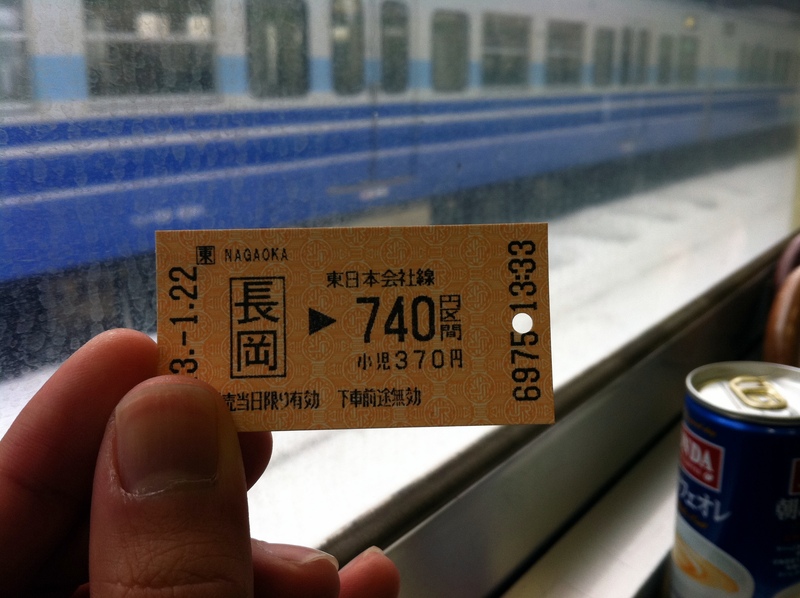 Round trip, the fare comes to 1480 yen, which isn’t too bad… but some consider to be pricy considering the distance. 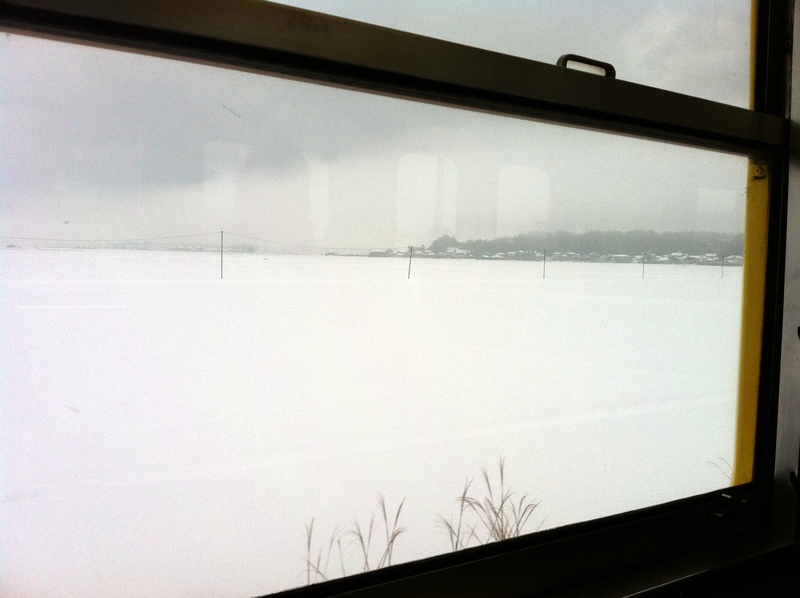 Going to Yahiko by car would probably be cheaper, and maybe even a little quicker, but with the ridiculously heavy snow we’ve been having this year, it’s just safer to go by train. 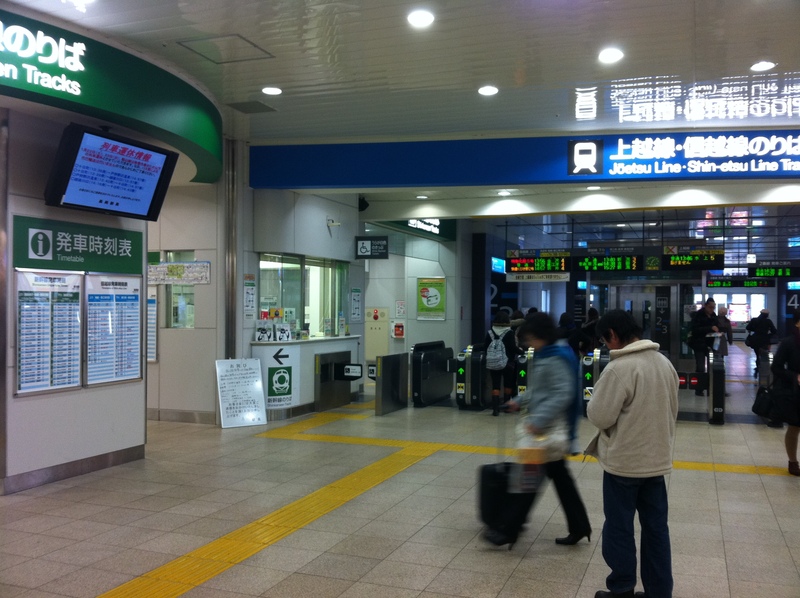 30 minutes later, we arrived at Higashi-Sanjo Station. Fortunately, we had a 1 hour wait till our next train so I figured it would give us the chance to look around. After spending an hour in the waiting room watching a TV show about ramen, our transfer finally came. A few stops later we pull into Yoshida Station where we transfer trains, again. But this time into a much more colorful looking train. 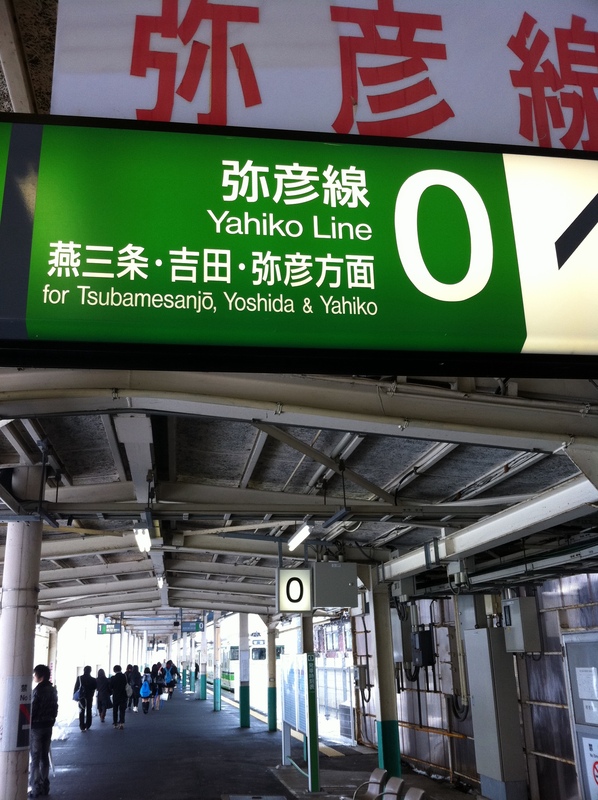 If it seems we’re zooming through the Yahiko Line pretty fast, it’s because we are. With just 8 stations, and 17.4km of rail, you can be on and off the train before you know it. But that doesn’t mean there’s nothing to look at. In the summer, you’ll see miles and miles of sprawling rice patties. There’s a nice sense of calmness and tranquility when the rice stalks sway to a passing breeze. A literal ocean of green. Now it’s not to say that the view isn’t nice. On this particular day, the snow just wasn’t letting up. 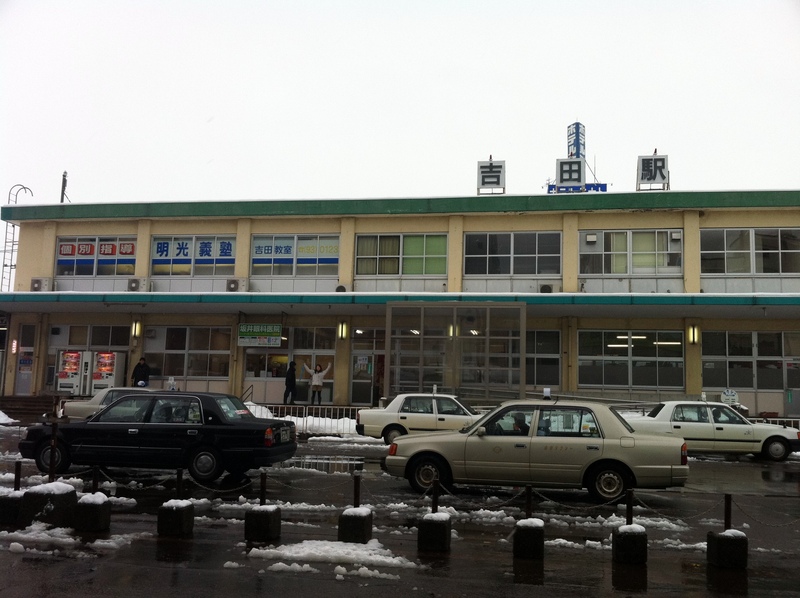 Coming into Yahiko Station, you can’t help but notice that this station is a little different from the others. Outside of the metropolitan areas, stations can usually look quite simple. 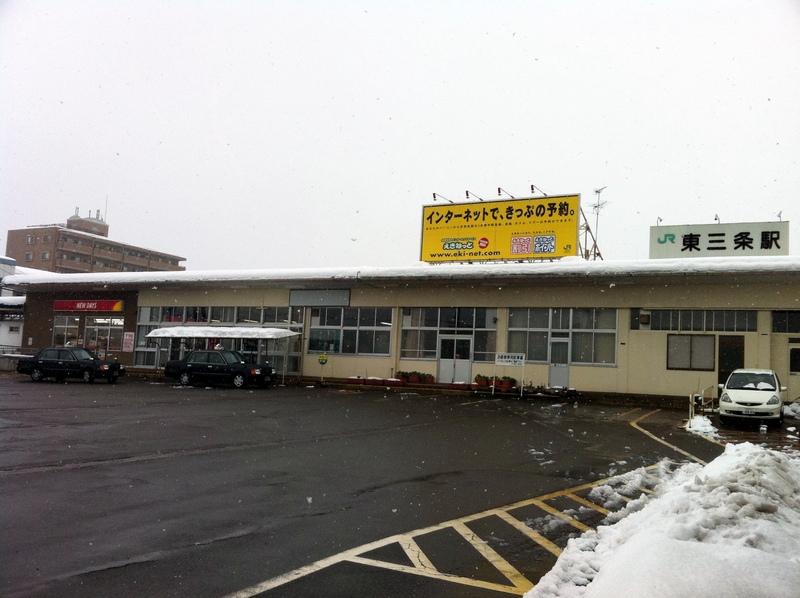 Most stations have an attendant to help with ticketing or other transit business, but when you get far into the countryside like, like here, some stations are called 無人駅 (mujin-eki), which means that there is no one staffing the station. Obviously, this means that there can be some people who may board the train without paying full fare, or traveling from one mujin-eki to another without paying any kind of fare whatsoever. However, this being Japan, they seem to rely on the trust system and most people do buy the appropriate ticket and pay the appropriate fare to their destination regardless if there’s a train station attendant to check their ticket or not. Crazy, huh? Anyways, getting back on topic, this station differs from most because its designed to look like a temple! 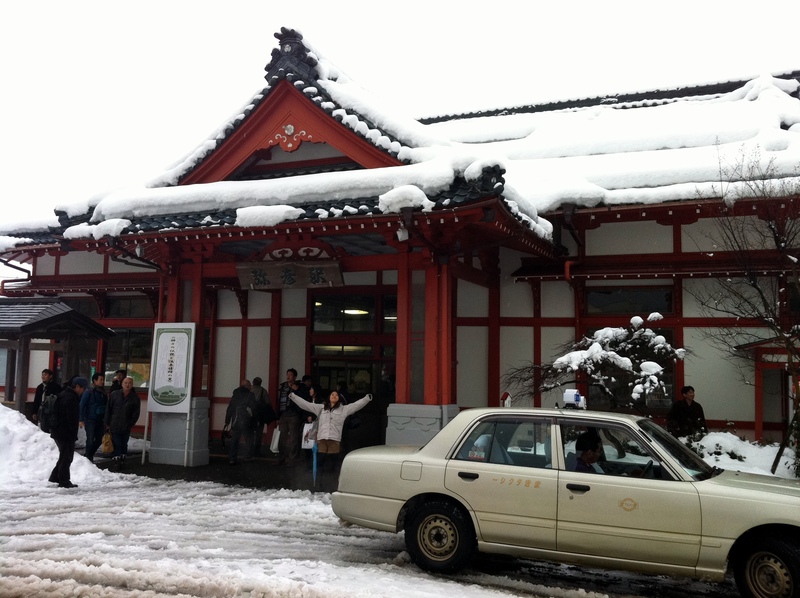 The roof is constructed with traditional red tiles, while the conductors booth and ticket gate resemble the main hall of a Japanese temple. Stations can sometimes deter from the usual construction design, especially if the station is in a heavily trafficked area, such as a tourist destination. The Mt. 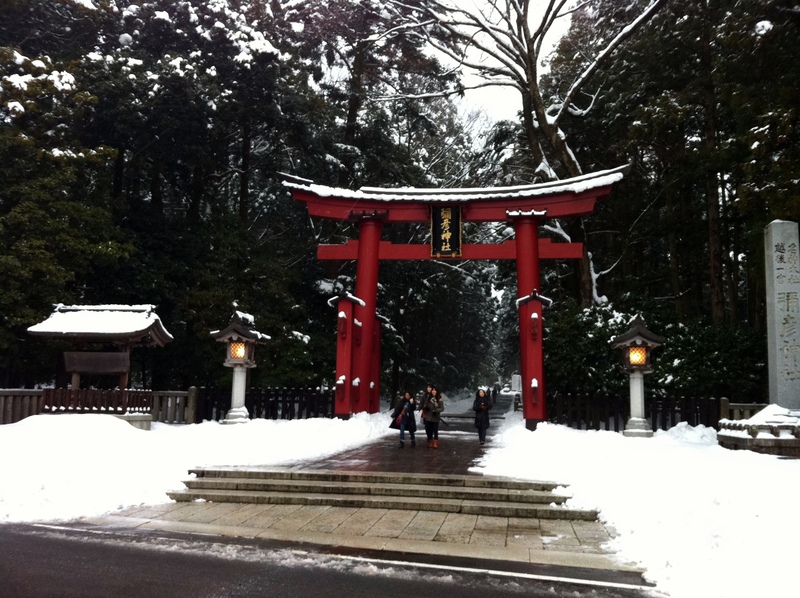 Yahiko area relies on tourism as it’s famous for its hot springs and of course, Yahiko Shrine. 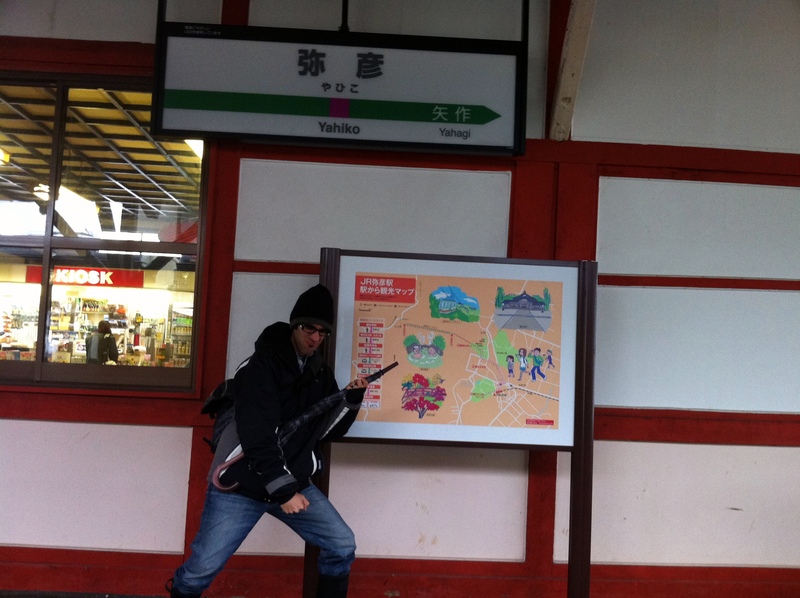 Outside of Yahiko Station, there’s an information booth which has maps (in English!) about the local area. They also provide a list of hot springs within walking distance, however it is HIGHLY encouraged that you arrive early enough as most of the day spas seemed to be open to visitors until around 4pm. Most of the hot springs are located at inns scattered throughout the area, so it leaves us to believe that they close off the hot springs after a certain time to allow priority to the guests staying at their resorts. Just a guess. 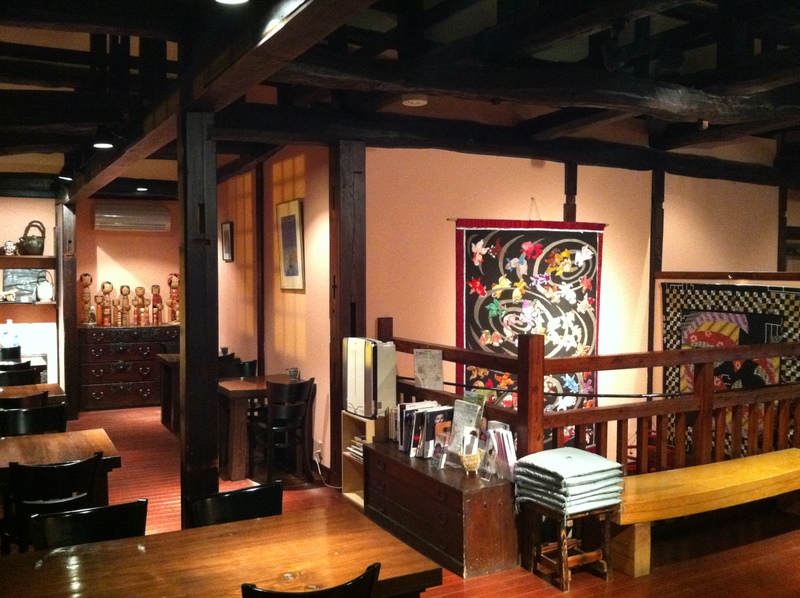 A 15-minute walk from the station leads you to Yahiko Shrine. With the HUGE red torii, it’s pretty difficult to miss the entrance. After passing the torii, you come to a lush green forest. With all the snow perched on the branches high above, it’s quite the sight to see. 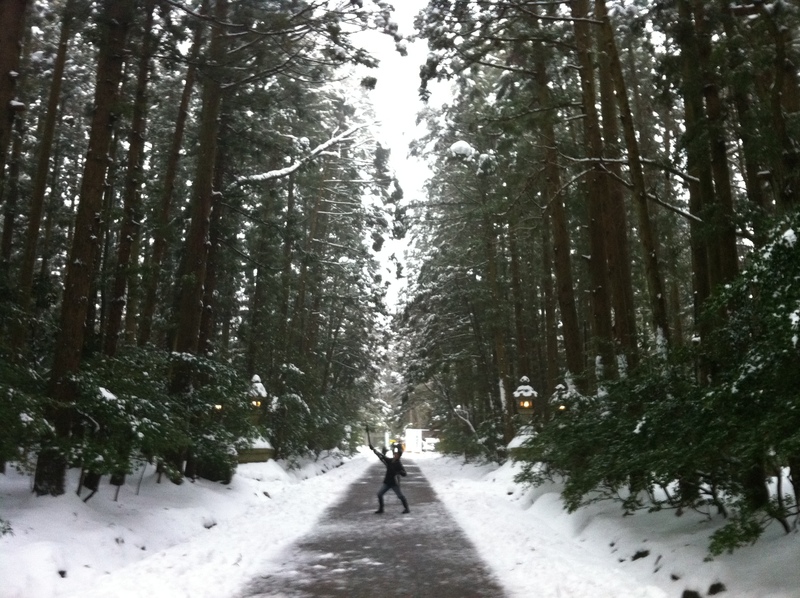 What made walking through here wild was that every so often, you’ll hear the snow falling from the branches. There were even times where the branches just couldn’t support the weight of snow, bring both the branch and snow down. Kinda felt like Indiana Jones walking through the temple avoiding the various traps throughout the way…but colder, I’d suspect. History points to Yahiko Shrine being over 1,300 years old. However, the area where it sits now has had a turbulent history, such as civil wars, natural disasters, and other events. The shrine we can see today was built in 1916 as the former one was destroyed due to a village fire in 1912. (Don’t worry, I’ll cite my source later). 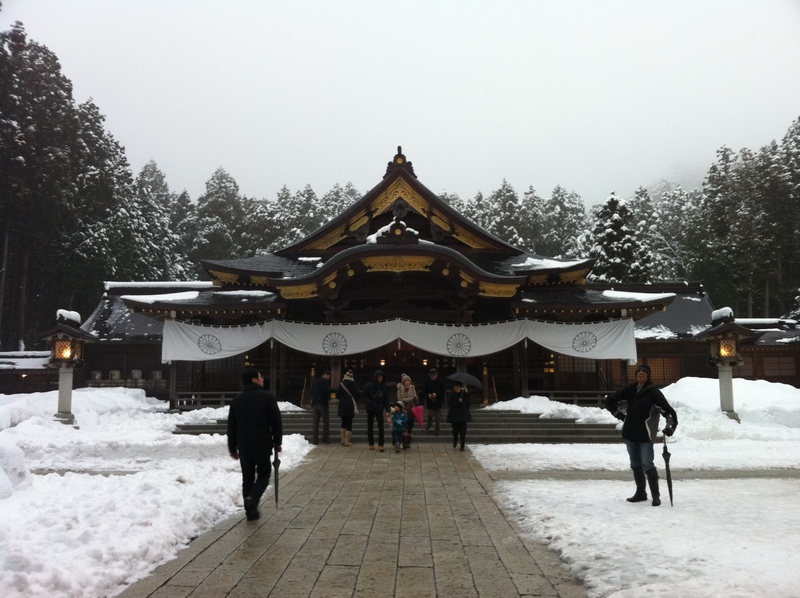 Unfortunately it couldn’t been seen on this day, but Yahiko Shrine sits in the shadow of the 638-meter high Mt. Yahiko. Outside of winter, visitors can ride a ropeway to the top of the mountain giving them awesome views of both the Japan Sea, and the inland valley of Niigata Prefecture. From this view, you’ll really be given the chance to see just HOW MANY rice fields there really are. It’s insane! staring contest. ready? go...........I WIN. 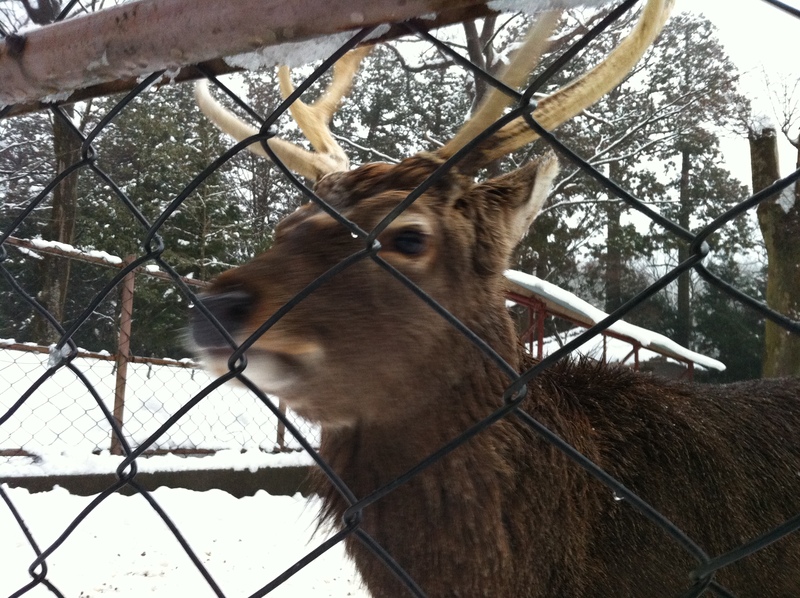 Near the shrine, there’s a small fenced area with a dozen or so deer. Not sure why. The sign was either buried in snow or it was too cold to find one. One of those reasons. Sunset was quickly approaching, but it wasn’t late enough for dinner, so we thought it was time for a coffee break. Fortunately, there was a coffee shop just across the street from that torii that I showed earlier. The first floor is a gift shop selling local items such as sweets made from locally grown rice, and a WHOLE BUNCH of other stuff. Really good selection if looking for souvenirs. 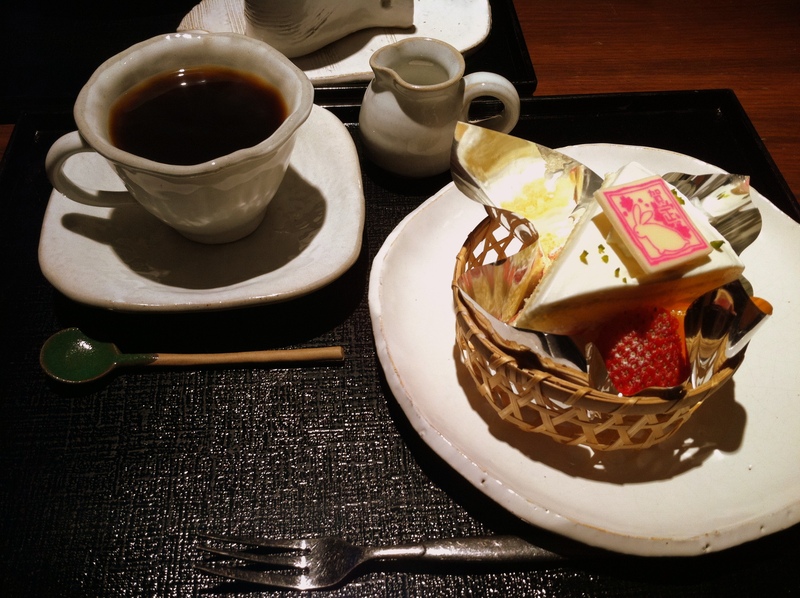 i opted for the cake and coffee set...and im glad i did. Fresh from coming off a sugar high, a trip to Yahiko wouldn’t be complete without visiting the hot springs. Remember when I said earlier that it’s best to arrive early? Well, after around 5pm, only 3 places are open (with the information booth telling us to avoid 2 of them), leaving us to go to a place called Sakura no Yu. We were familiar with Sakura no Yu as we’ve been to it by car once, but I didn’t realize at the time that it was so close to Yahiko. 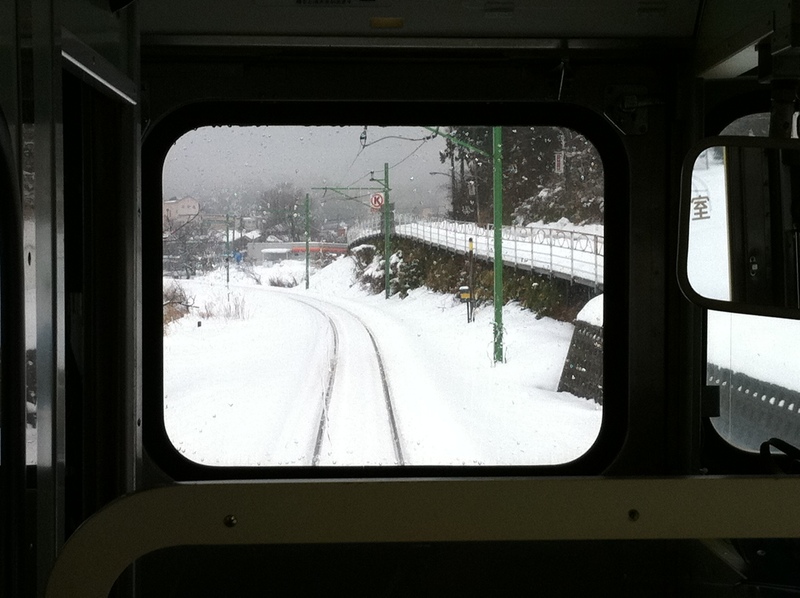 From the station, you can hail a cab and it’s just a short 5 minute ride to the hot springs. Fare came to about ¥1100 one way, so the more people riding in your cab, the cheaper it can be! Obviously taking pictures within the hot springs is forbidden (since there’s naked people inside! ), so I’ll have to rely on this picture from their website to give you a view of the baths. ¥950 (about USD11.50) gives you a day pass into the hot springs, which seems a bit pricier than most, but it also offers a lot. With the price of admission, you get a yukata (Japanese robe), towel set, unlimited use of the hot springs, and all the soap and shampoo you can wish for. There are about 7 different baths you can try, including one that changes themes daily. On this particular day, there was an herb bath which smelled like well, herbs. There’s also a full-service restaurant, lounge with massage chairs, and a sleeping room. Overall, an excellent place to get away. Dinner was pretty dang good too. After dinner, we took a taxi back to the station, and then made our way back home. For a day-trip, it’s an excellent choice. If you live near Nagaoka City or Niigata City, it’s almost too close where it at least warrants a return or two. If coming from someplace further, there are plenty of inns that can put you in for the night at a variety of prices, depending on the level of service you’re looking for. So, that does it for the first edition of Densha de Dan. How was it? I’d like to know!! Until then, see you on the next trip! 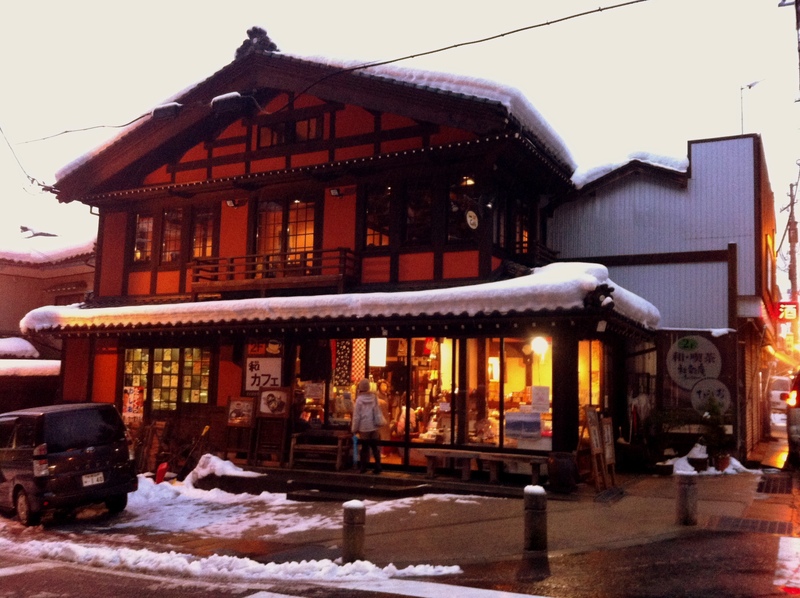 Yahiko Village Official Website – All in English. Gives access information and points out points of interest. 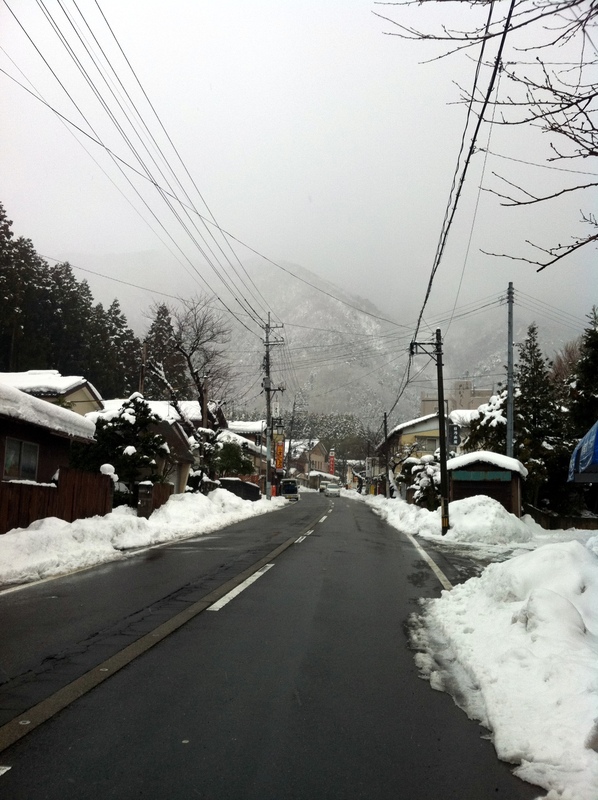 Yahiko Onsen Guide – An excellent PDF English pamphlet about Yahiko Onsen. Very useful map included. Sakura no Yu – Official Website. 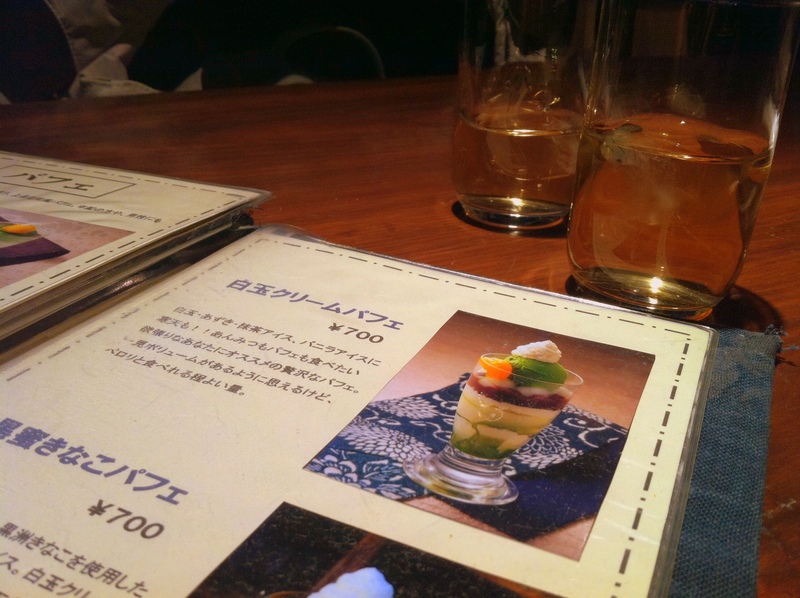 All in Japanese, but plenty of pictures to give you an idea of what it looks like.